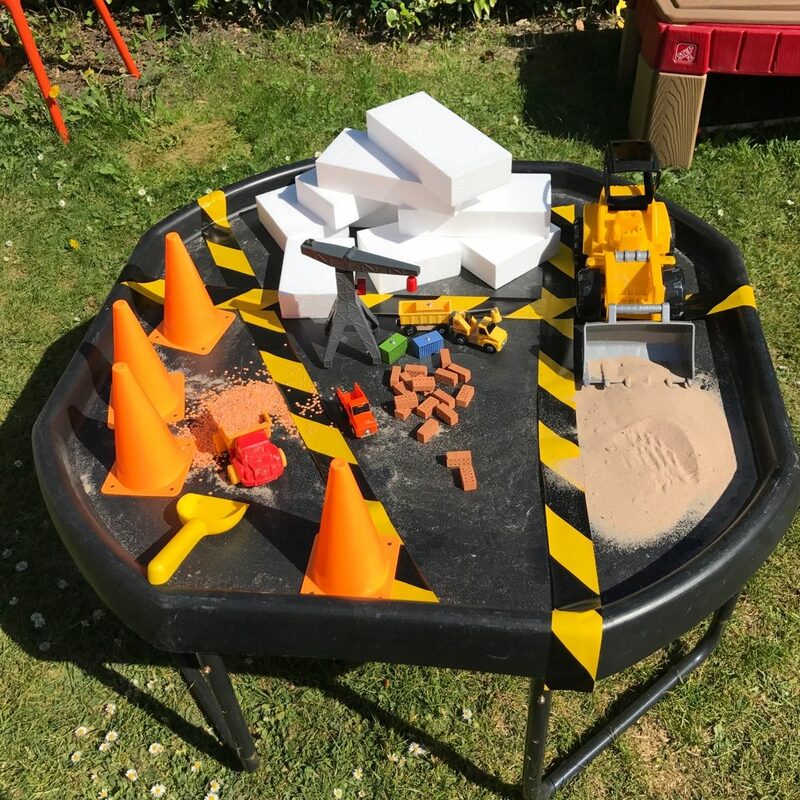 I’m used to creating tuff spot set ups for children in Reception and Year 1, so I needed to think how I could do this to support my son who is a toddler. I’ve realised it’s not that different for a younger child, as it’s down to how the child interprets the activity. It needed to be an entertaining play activity for my son, as an open-ended activity which he could explore. The setup allowed Rex to explore the different textures and sizes of construction materials. I used a range of construction vehicles I already had at home in his toy box so I didn’t have to purchase anything further. 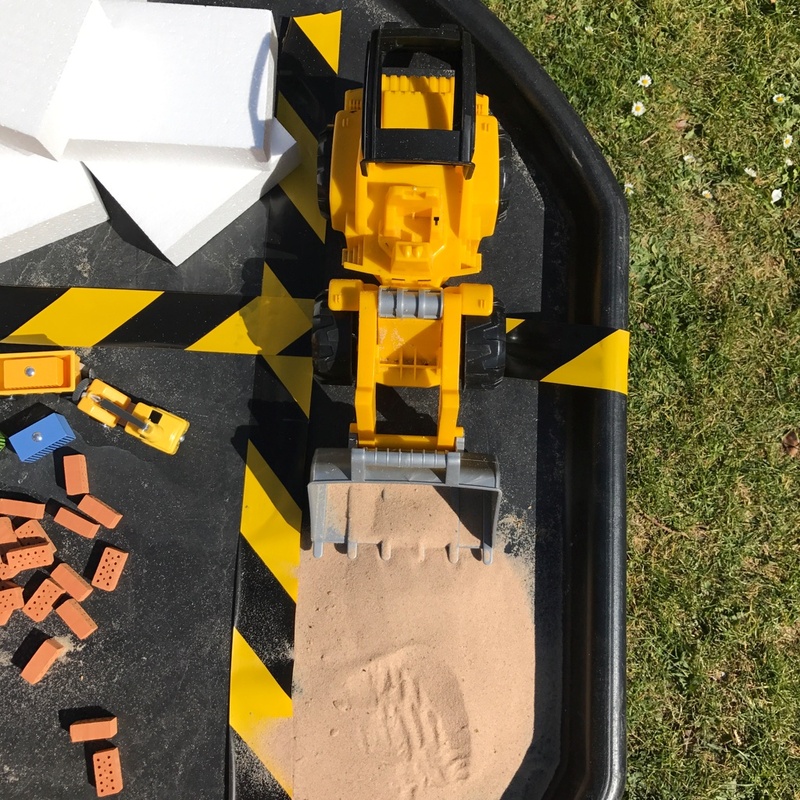 The difference in scale between some of the items, such as the digger and crane, felt jarring to me, but children don’t mind. It’s all about being able to explore and play. 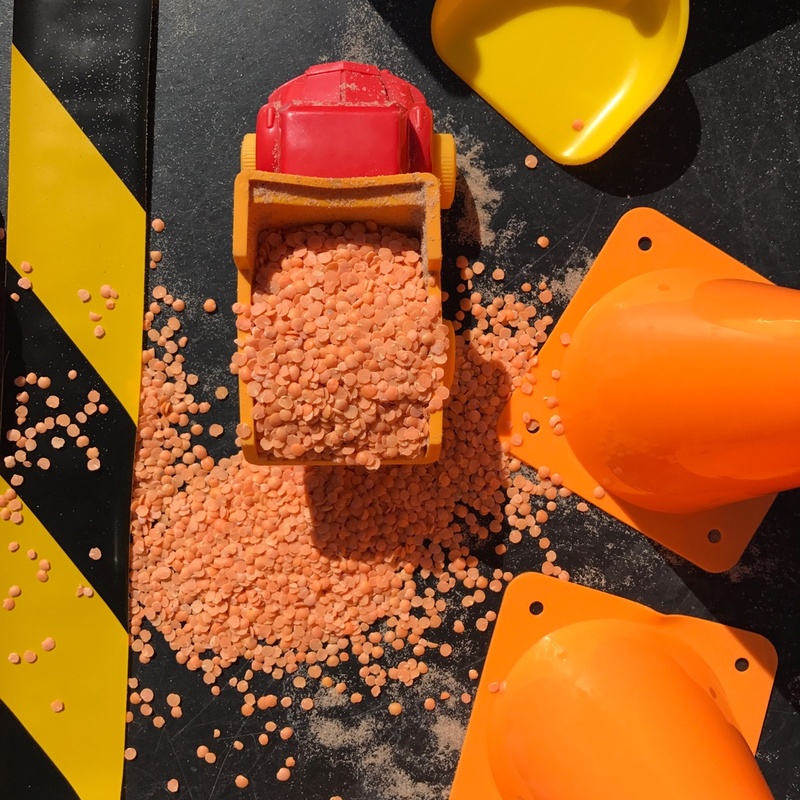 In this post, I’ll walk you through how I created the tuff spot, the thinking behind the objects, and highlight the challenges in supporting different children’s interests or ages. You might be wondering what a tuff spot is! 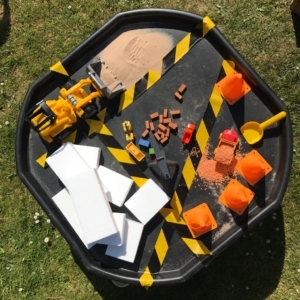 It is a large plastic tray perfect for setting up activities such as messy play, water play, play dough or art. You may have seen them being used in nurseries and schools. I like the way it has a little lip on the edge to keep everything contained, at least before it’s played with! I bought the tuff spot from Amazon but B&Q sell them as cement mixing trays. This is on a stand (also from Amazon) at the moment, but I often put it on the floor depending on the activity. I bought the super bricks suggested by the awesome @play.hooray. The bricks are also from Amazon and are called Teifoc Bricks. This was the perfect set up to be able to try them out. 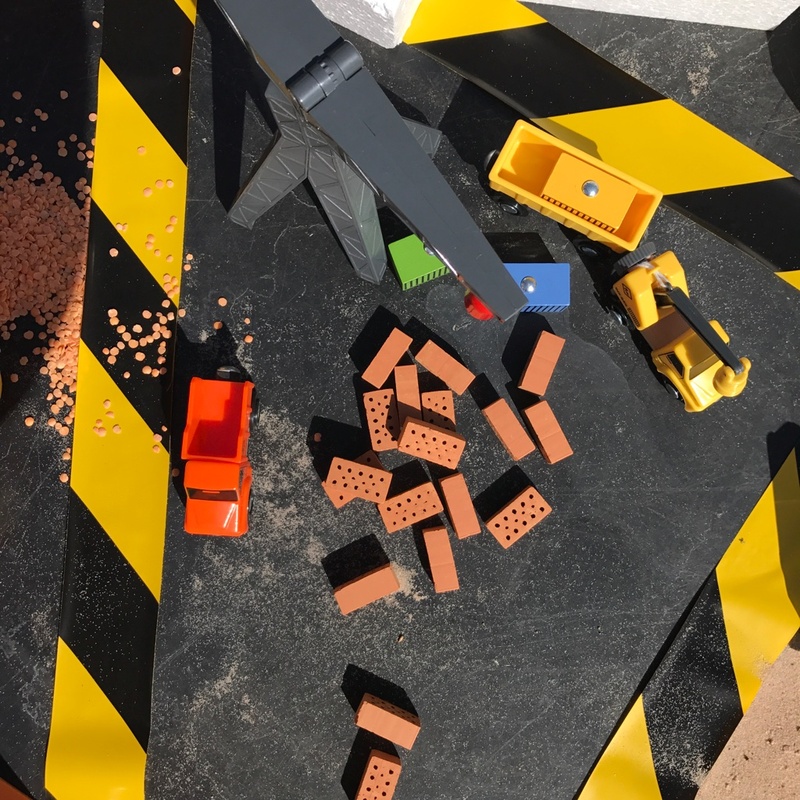 They are just the right size for little fingers and if you are feeling very adventurous you can actually buy Tefioc cement to go with them and build actual mini-walls if. I’m not ready for that yet so will be substituting the cement for homemade play dough, an easier way to join the bricks together. To add a different texture I used lentils which are perfect for pouring, tipping, and scooping. I’ve had these for years and don’t actually cook with them. Some people don’t like using food products so you could replace these with small gravel or glass stones. 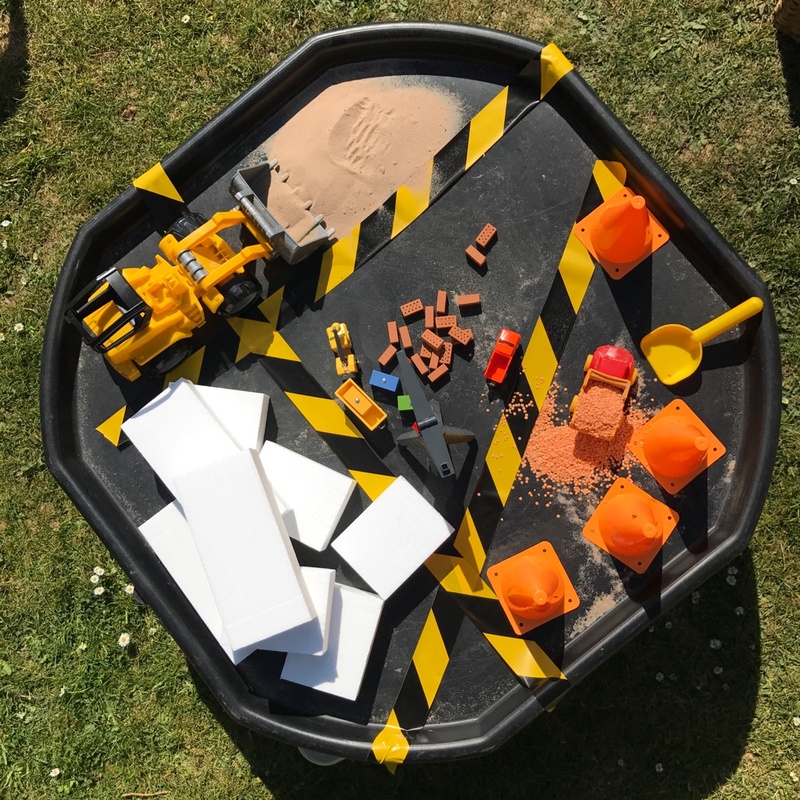 The plastic cones were from Poundland and I bought these for games in the garden but work perfectly for a construction site. All building sites need sand. I just used play sand from his sand pit. I would have also added pebbles and stones of different sizes if I had these to hand. I also popped in a couple of mini spades from the sand pit to support the tipping and pouring. I had some polystyrene blocks collected from empty boxes. (I’ve only used ones which haven’t been broken.) I find endless packaging sent in parcels and try to save as much as possible for setting times like this. 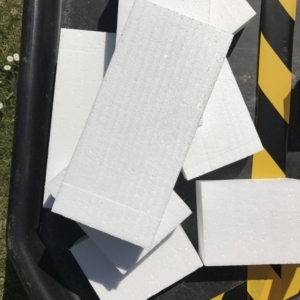 In the end, he didn’t use the polystyrene blocks but wanted to keep them for the following day. I have also included some construction style tape, which was a quick and cheap way to make it look and feel more like a building site. This was perfect for my son but I wanted to think of ways I could extend and change the tuff spot depending on your focus or the child’s interest. I know at the moment my son loves tipping, pouring, and stacking so this works great for that. What I loved about this set up was, after he played for a while, he then extended his play by taking the sand and lentils and spreading them on the ground, he told me he was planting seeds and being a farmer. This is what I love, now to think of a farming tuff spot activity! 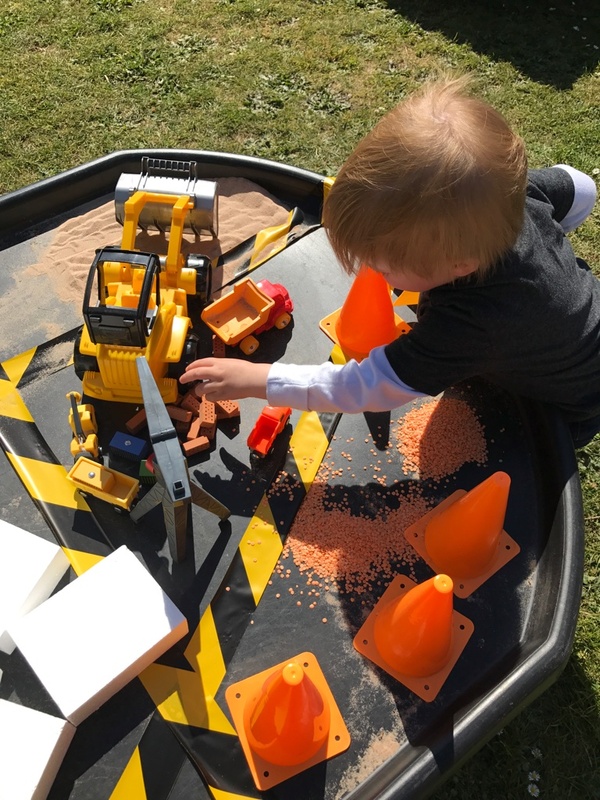 If I was going to this again or use it in a nursery or school, I would add familiar books you have around the house relating to building, construction, or even catalogues such as Screwfix – my son loves reading about tools! 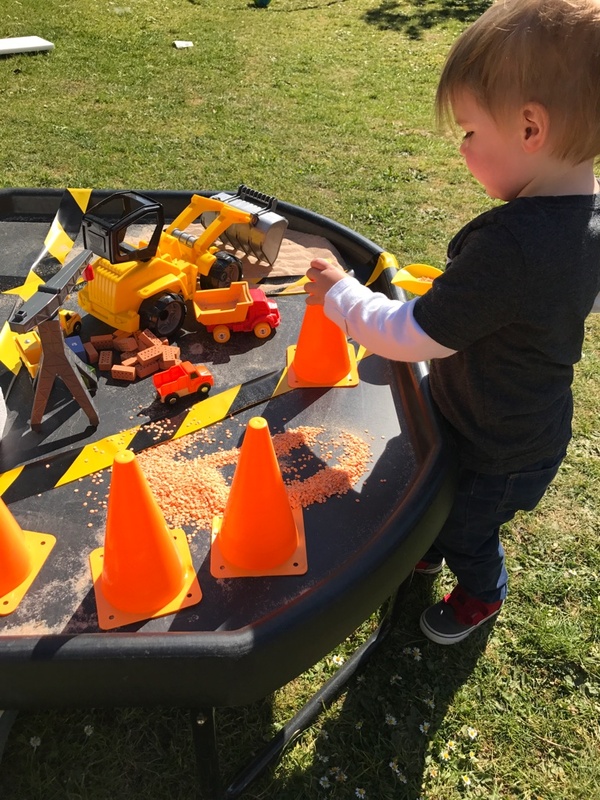 Label the different items within the tuff spot, which quick and easy to do and instantly extends the play – children love labels! I would leave some labels blank so the children can have a go at writing labels themselves. Plain white sticky labels work well for this. Another way to encourage early mark making would be to have a couple of clipboards with paper or design sheets. This set up would also make a great opportunity to add maths learning. Hiding some numbers around the building site, encouraging children to count out the bricks or other objects. Including real life tools like ruler or tape measure, so children can measure different objects. Including a simple set of scales to compare the weight of the different materials is also a good idea. Even having opportunities to look at shapes and identify them will be valuable during the activity. I maybe a little bit obsessed with play dough but I think this is another easy way to change the purpose of an invitation to play. 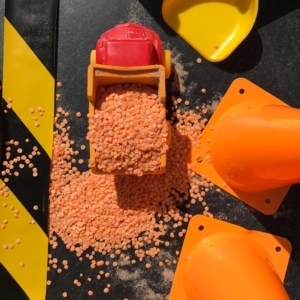 The play dough could be used as a cement to help join the different materials. Check out my recipe for moon sand which would also add a different texture to the activity. I found sharing real life situations with some children helps them related objects to different situations. This would work brilliantly here, take children to an actual building site, from a safe distance, of course! Looking around the local area I was surprised to see how much building work was actually happening! If this is not possible you can find building site videos on YouTube. A great way to make a tuff spot more interactive is to add sound to it. Sound effects from a real construction or building site are great. Freesound have some great free sounds, here’s a selection from a building site. I mentioned playHooray! 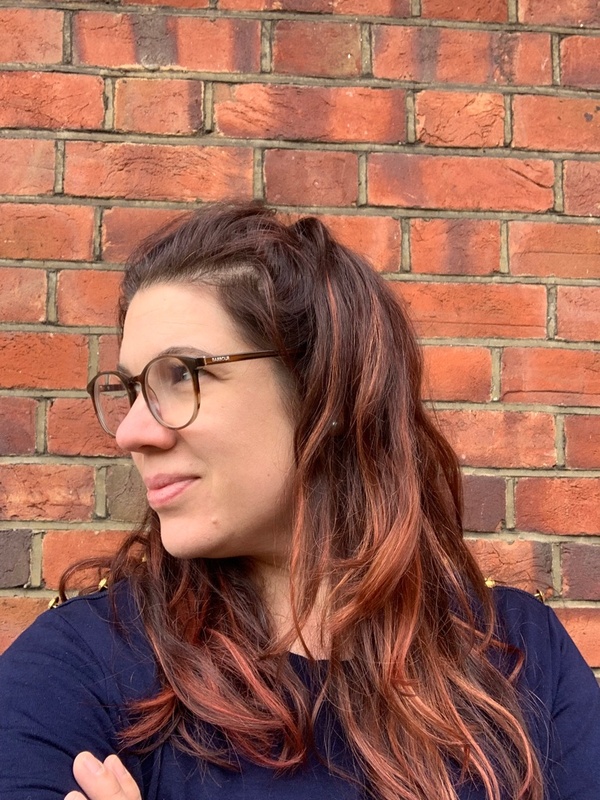 earlier – Claire runs playHooray, she has a super inspiring Instagram page sharing early years ideas and a website where you can buy playPrompts. There is a whole range; First Year Play Prompts to Outdoor Play Prompts, so if you ever get stuck thinking of something to do using mainly just household items they are a must. They have basically saved me racking my brains for a quick play activity. I recommend you check it out. There are so many more ideas I could share so if you would like more or have any questions please let me know in the comments below. Sign up to stay in touch and be the first to hear about new blog posts and downloadable teaching resources.